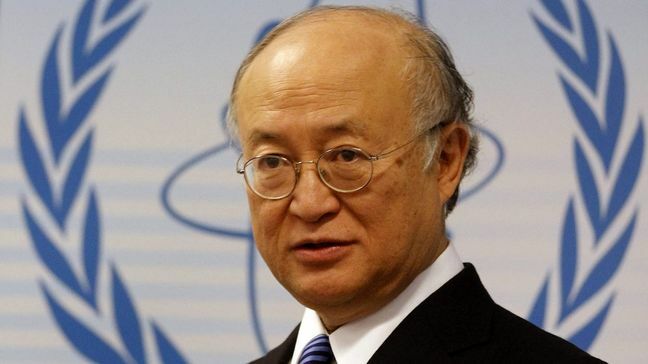 “Iran is implementing its nuclear-related commitments under the JCPOA,” Amano said, reiterating his position on the deal, known officially as the Joint Comprehensive Plan of Action, Reuters reported. Amano’s remarks came on the same day that Iran announced it has sent a large batch of mined uranium yellowcake for processing ahead of shipment to its main enrichment facility, Financial Triobune reported. Yellowcake, or uranium ore, can be further processed into enriched uranium to make fuel for nuclear power plants. Thirty tons of yellowcake from a production plant in the city of Ardakan in central Iran was sent to the Uranium Conversion Facility in Isfahan, which was reopened in June after lying idle for nine years. The activity is permissible under the nuclear deal, which allows Iran to enrich uranium to 3.67% and caps its stock of enriched uranium hexafluoride at 300 kg. Yellowcake is converted into a gas called uranium hexafluoride (UF6) before enrichment. It will be sent to the Natanz nuclear facility for enrichment. The UN nuclear agency said in June that the plant for the production of UF6, the feedstock for centrifuge machines that enrich uranium, had been relaunched at Isfahan Uranium Conversion Facility and a barrel of yellow cake had been delivered there. On Wednesday, US President Donald Trump, who has pulled his country out of the nuclear deal, called top US intelligence chiefs “extremely passive and naive” on Iran, a day after they contradicted his views on Tehran’s nuclear activities in congressional testimony. US-Iranian tensions have resurged since Trump pulled Washington out of the 2015 nuclear accord, calling it deeply flawed. Under the deal, Iran restricted its enrichment program to ease western concerns and in return won relief from sanctions. Leaders of the US intelligence community told a Senate Intelligence Committee on Tuesday that the nuclear threat from North Korea persisted and Iran was not taking steps toward making a nuclear bomb, conclusions that contrasted starkly with Trump’s assessments of those countries. Iran says based on its principled policy, it will never pursue nuclear arms and only looks to exploit nuclear energy for civilian applications such as power generation and medical uses. Director of the US Central Intelligence Agency Gina Haspel said at the Tuesday hearing that Iran is abiding by the terms of the nuclear accord despite the US pullout from the multinational agreement. “At the moment, technically, they are in compliance” with the JCPOA, Haspel said, AFP reported. “I think the most recent information is the Iranians are considering taking steps that would lessen their adherence to JCPOA as they seek to pressure the Europeans to come through with the investment and trade benefits that Iran hoped to gain from the deal,” she said. Haspel noted that Iranians are making some preparations that would increase their ability to take a step back if they make that decision. Trump cited Iranian rocket launches and contended that Tehran was “coming very close to the edge”.